A while ago I shared Steve's clever lit-from-below solar terrarium craft. 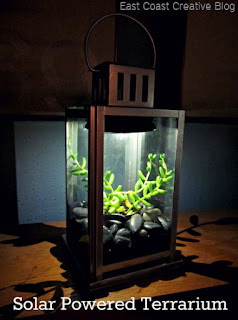 Here is a link to the East Coast Creative Blog DIY instructions for a solar "lantern" terrarium that would make a cute set of decorations for an outdoor evening party. The crafters use budget supplies and each terrarium ends up less than $15. See the DIY guide at InfarrantlyCreative.net. Great post it's very helpful for us Send gifts to Pakistan .